I’ve been posting about the way re(peat)-photography permits access to another’s seeing, while Greg Neville and I have been working on a such a project for Melbourne. What if the project entailed revisiting one’s own imagery? 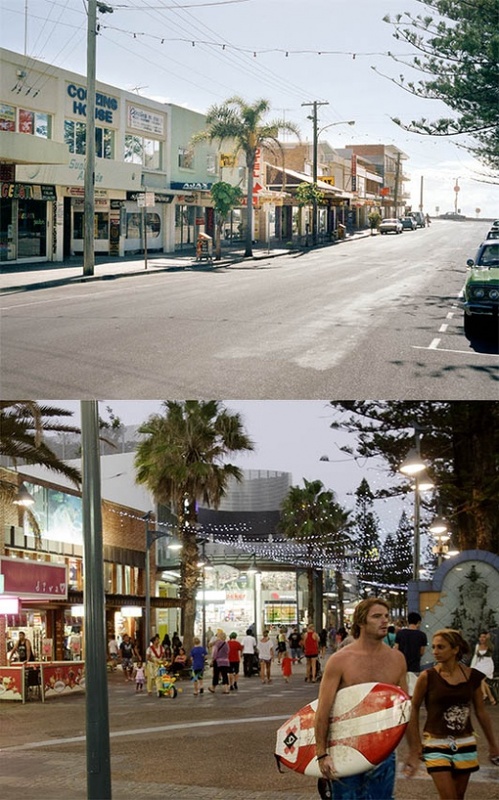 John Gollings’ rephotography project at Surfers Paradise (coming to Gold Coast Arts Centre June 29 – August 11, 2013) is more than a powerful personal example of the genre, it is also a remarkably prescient document. It is only as one gets older that we have the resource of a personal history long enough to be able to produce such a work. Nostalgia is one thing, but to stare change in the face, as Gollings does here, is to do away with mere sentiment. The original ‘take’ is the product of a young man on a mission, driven by a philosophy tuned to contemporary ideas. Likewise, I’ve described 1960s photographer Mark Strizic’s association with Australian Modernist architecture and his photography, and with Robyn Boyd, as well as his sympathy, evident in his photographs and murals, for Boyd’s thesis. Coming a generation later Gollings, deserves his reputation, as Strizic did then, as ‘one of Australia’s foremost architectural photographers’. While Strizic’s interest in architecture was fostered at his father’s knee, Gollings’ was a more formal learning. Born in Melbourne in 1944, John Gollings keenly embraced photography at 11. He studied Arts and Architecture at Melbourne University, supplementing his studies with architectural and wedding photography. As Australian architectural style began to evolve and develop, so did Gollings blend formal composition and contextual perspective as he travelled the world to document striking government buildings and luxury hotels, as well as the Greco-Roman ruins in Libya and the heritage of India and Nepal. 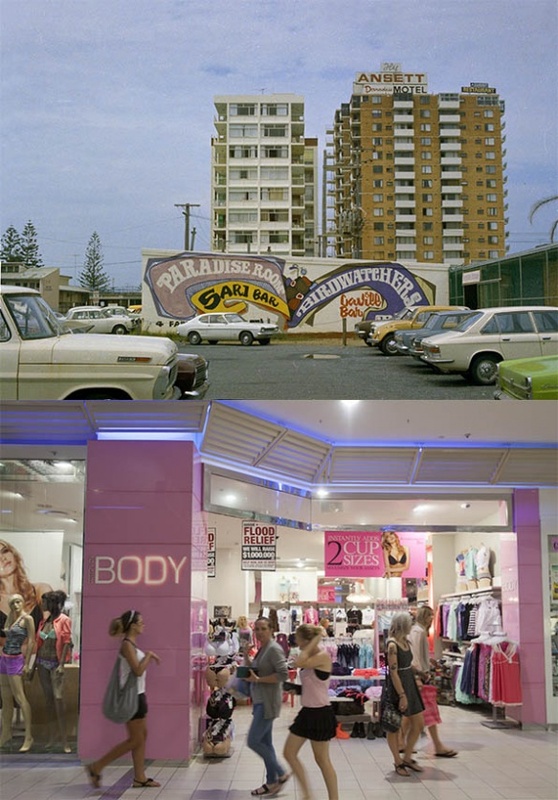 His Shooting Surfers Paradise: A Rephotography Project 1973-2013 pairs images he took in the seventies, in a young man’s Arcadia, with those of the mature and accomplished architectural photographer he has become. Placed one beneath the other, these photographs rub at each other to strip away the glamour of the remembered experience, just as time has worked on the famous Surfers to sharpen it to a glitz as hard as nails. In an age of rising sea levels and threatened reefs, the wide view is as revealing as the close-up; the sand is now definitely whiter, and newer, in Gollings’ view from the incoming plane. The ugly power poles have vanished from the streets, and Spanish Mission has been replaced by LA high rise tower. It’s a tidier place, but looks a little harder, and ironies embedded by Gollings within these pictures surface. The 70s brown-brick Ansett Hotel and the Birdwatchers bar and their carpark full of lean panelwork vanish, obliterated by an indoor view of an undergarment shop in a mall. The shop sign reads ‘Body’ in gleaming rounded bronze-plated caps in contrast with the pseudo-Art-Nouveau signwriting of the bar sign. Inside, the shop sports a Flood Relief Appeal poster next to a merchandising sign promising ‘two cup sizes’ as casually dressed female shoppers stroll by. The nature strip of the Golden Mile Flats is now a trampled sandpit in front of a much less friendly, blank facade. It almost seems he had the repeat photography exercise in mind! The shots are intelligent and wry as they adapt to the changed scene. Gollings religiously deploys the same lenses and cameras, including a Widelux, as for the original shots, and positions himself right where he stood forty years ago, despite saying he is ‘a bit embarrassed now’ by the fisheye shots, but having copied them ‘in the name of veracity’. 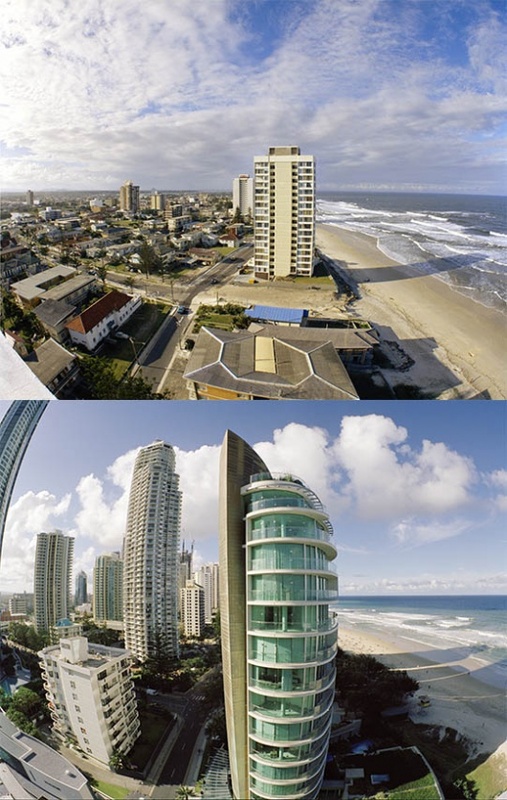 The decision in 1973 to use a super wide for a panoramic view from a high rise results turns out to be a happy one; the retake, despite the massive towers that have since grown next door, still permits a view of the coast. The wide angle comically bloats the already bulging forms of the closest of these high rise apartment buildings. Like Mark Klett, the doyen of the genre, Gollings is careful to shoot at the same time of day, perhaps not as fastidiously in terms of seasonal chronology, as this exercise appears to be at a different time of year; nevertheless the shadows obligingly stretch across the same strip of beach. While the old Surfers was a pop-culture paradise, an unapologetically commercial tourist-oriented place, the new is far more brutal. Behind this work, and driving both Gollings’ original excursion to Surfers to photograph, and this recent return, is the book Learning From Las Vegas: the Forgotten Symbolism of Architectural Form by Robert Venturi and his partner and wife Anne Scott Brown with Steven Izenour. 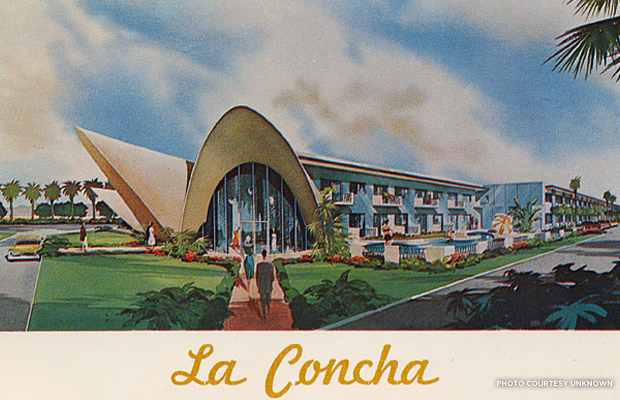 La Concha hotel, Las Vegas in a 1960s postcard. Learning from Las Vegas was based on an extensive research trip Venturi and Scott Brown undertook with their architecture students of Yale University in 1968. The studio project is documented at http://smg.media.mit.edu/classes/DesignSocMedia07/venturi.pdf. Mapping surveys were conducted through hundreds of photographs and filming of the perspective the urban landscape forced by travelling in a moving car, and the consequent inflation of signage and conflation of signage and architecture that resulted. 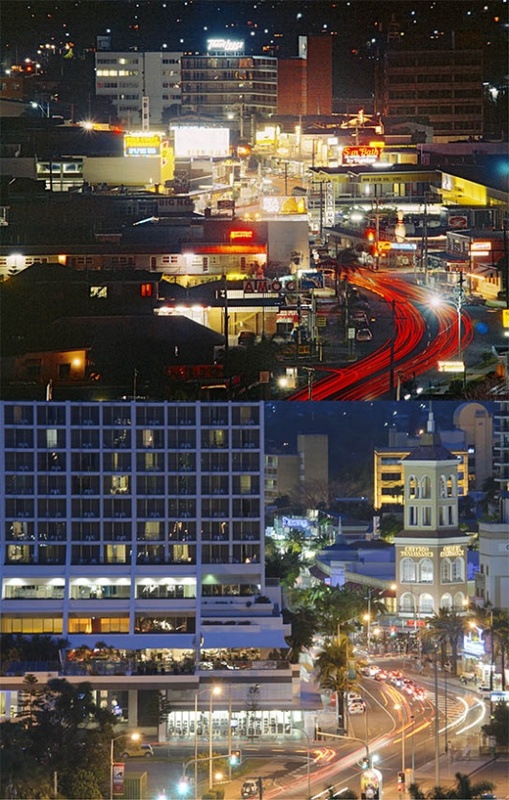 Their study of the strip city became one of the most influential and controversial books in 20th Century architecture. It was a rebuke to orthodox modernism and elite architectural tastes, and a pointed acceptance of American sprawl and vernacular architecture. The book coined the terms “Duck” and “Decorated Shed” as applied to opposing architectural styles, both demanding a reassessment of the Modernist banishment of embellishment. Alongside Gollings’ show at the Gold Coast Arts Centre June 29 – August 11, 2013,the luscious colour photographs taken by Venturi and Scott Brown, retrieved from the private archive of the architects, will be exhibited as Las Vegas Studio: Images from the Archive of Robert Venturi and Denise Scott Brown. 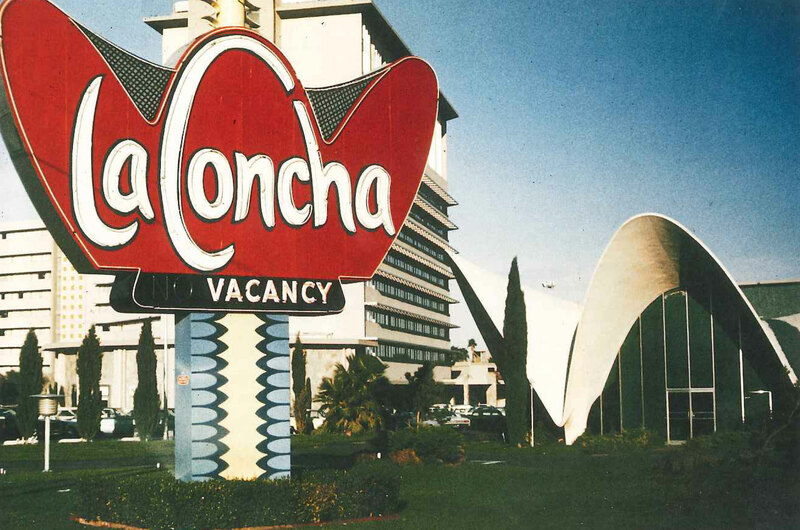 They capture the Las Vegas of the exuberant sculptural signage, of large cruising Chevrolets, and the incongruous meeting of desert landscape with the intensity of the strip city. Developed by the Museum im Bellpark Kriens and the Deutsches Architekturmusuem Frankfurt, this exhibition has been presented to great acclaim in Europe and America and will be shown only in the Australian city that unquestionably has the closest relationship in cultural and design terms to Las Vegas. Venturi, R., Brown, D. S., & Izenour, S. (1972). Learning from Las Vegas (Vol. 102). Cambridge, MA: MIT press. ← A secret is out!